This Blue Faced Leceister was raised here in Vermont, as was the majority of the kid mohair I blended it with (I had some left over from a purchase at MDSW and threw that in as well, so the kid is not totally VT...but the wool is). I dropped it off at the mill during the VT Sheep & Wool Festival in September and it just arrived this week. Part of the English Longwool family, the Blue Faced Leceister is most recognized by it's finely wound little curls (see photo below). I seek this breed out when I'm purchasing for locks for the store since the tightly curled and wound lock structure makes for nice hair and beards in needle felted critters. You can recognize the sheep by its bluish face too....an illusion that comes from white wool covering black skin. But the fine wool (fine as far as the longwools go, not fine as in merino fine) is lustrous and lovely to spin and knit too! 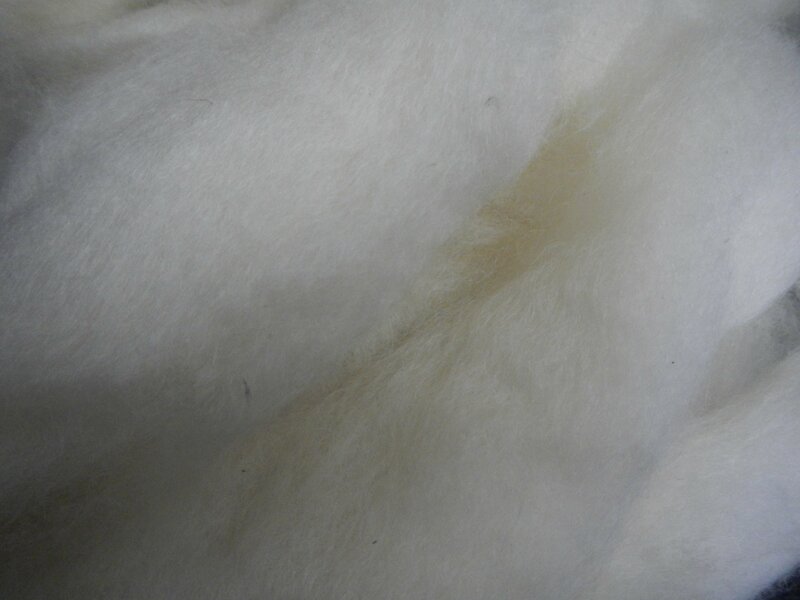 So the blend with soft and lustrous kid mohair just doubles the beauty of this gorgeous, creamy white fiber. It is approx 60/40 blend and is so soft. Chris was drooling over it as she weighed out and bagged it this week! Because of its' luster and length, Blue-Faced Leicester shows great stitch definition. And it is finer than the other Leceister longwools, having a micron count in the range of 24-28ish. So, combined with about 40% kid mohair, you can imagine how silky and lovely it is to spin!